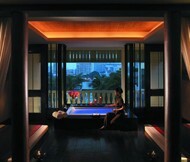 At the 4th floor of the Pullman hotel Bangkok, a large door open to a dimly lit space. 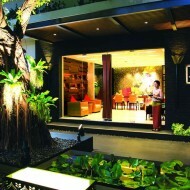 Khun Ploy the spa manager greeted us by the name. Since we made reservation and pre-selected our treatment she was able to recognize us when we arrive. The sweet scent of ylang ylang (dok kradangha ดอกกระดังงา) from the oil burner was very noticeable. 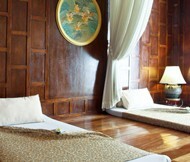 We were guided through the dark hall way to the Spa suite, a large almost a 100 sq.m. space with a foot wash station, Thai massage platform, 2 oil massage stationห, a large jacuzzi for 2, and a steam room with a rain shower shower. 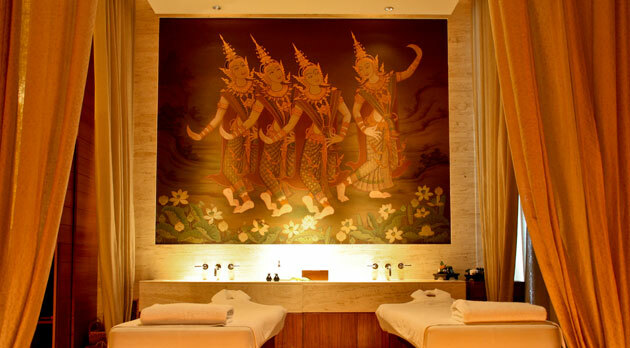 The ambiance in the spa suite is gold from the golden teak wood floors, gold leaf wall paper and gold lights. There is an eye catching Thai fresco of a dance where the dancers wear golden jewelry. The suite looks out to the beautiful garden courtyard, too bad we did not have it open. Our treatment was aroma oil massage and a milk bath in the jacuzzi. Pullman is a French brand, the only thing French that really appeared in the spa is the disposable thong underwear provided with the treatments. Something we don’t see much in Bangkok spa, a nice touch. We started on the oil treatment bed, face down a rough and hard press was applied to the back which caused a cracking sound from my back. Khun Pum the therapist did that to awaken my senses and thats what it did, it was more like a shock. It seem to hurt but it was really a relief. After that it was quite relaxing, and things became a bit blurry maybe that stunt caused it. The restful massage went on for an hour. The oil for the massage had the same scent as the oil burner. The therapist was very thorough with the treatment. After the massage we were given some time to rest, in the jacuzzi. The water was pre-filled before the treatment but still warm, but we like it warmer. While filling the tub our therapist came with the mixture for the bath. The mixture made the clear water opaque white. The chroma light and the jacuzzi was then turn on with nice pressure to the back and feet. We sank back and let the warm water take the therapeutic action. It gave a nice sensation through out the body. The bath made this treatment a real treat for a weekend get away. Relaxing Aroma Massage with Warm Oils 1 hr./ 1 hr. 30 mins 2,800/ 3,800. Jasmine Rice Body Exfoliation 1 hr / 2,300 .